First Lok Sabha Election (1951-52): In independent India’s first Lok Sabha elections, the Indian National Congress (INC) obtains a landslide victory and Jawaharlal Nehru becomes India’s first prime minister. 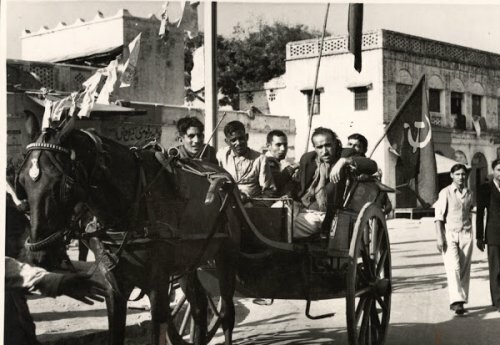 The picture shows Communist Party campaigners riding a tonga in Karol Bagh, Delhi before the general elections. Second Lok Sabha Election (1957): The Indian National Congress headed by Nehru retains power. 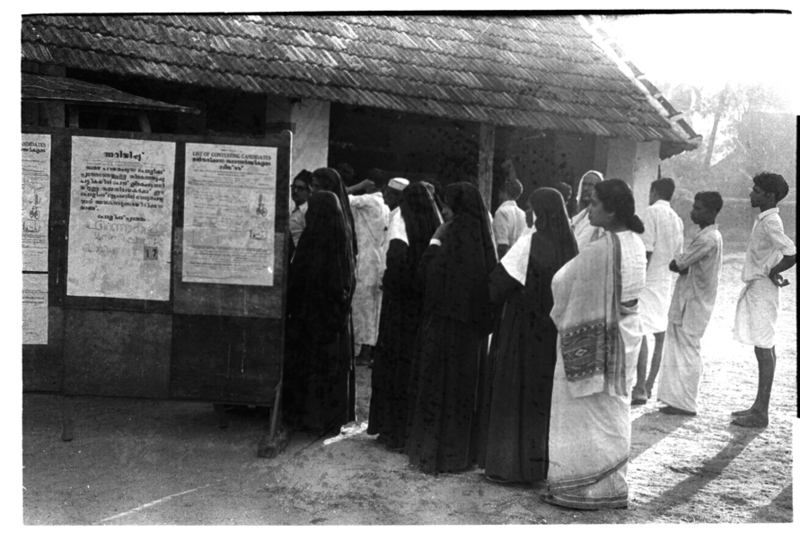 Picture shows women, including nuns, standing in a queue at a polling booth in Kerala to cast their votes. 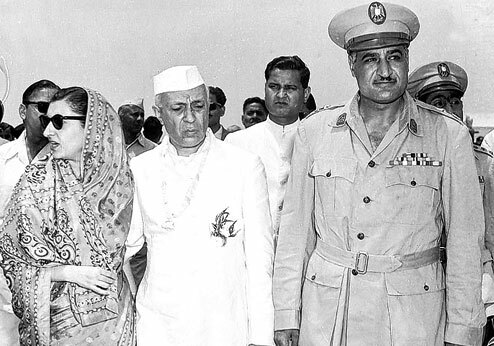 Second Lok Sabha Election (1962): Jawaharlal Nehru seen here with Gamal Abdul Nasser of Egypt, leads the Congress Party to a resounding victory in the 1962 elections. Nehru dies in office and is succeeded by Lal Bahadur Shastri. Shastri too dies in office. The Congress Parliamentary Party then elects Nehru’s daughter Indira Gandhi as Prime Minister. Fouth Lok Sabha Election (1967): The National Congress Party under the leadership of Indira Gandhi retains power but there are emerging signs of a decline in support for the party. 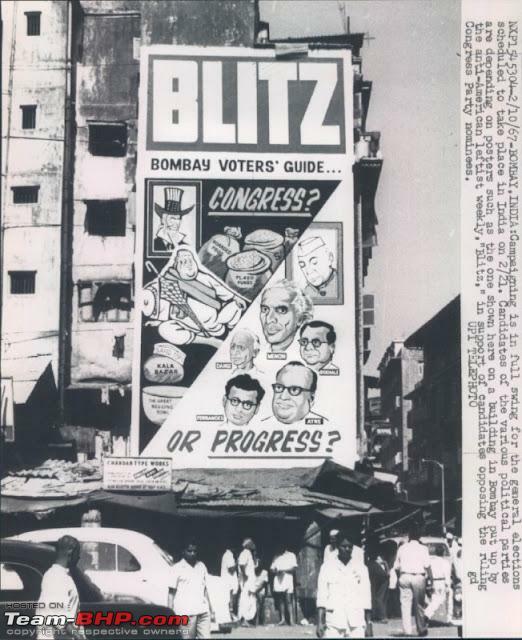 Picture shows poster put up on a building in Bombay by the anti-American leftist weekly “Blitz,” in support of candidate opposing the ruling Congress Party nominees. Fifth Lok Sabha Election (1971): The Indian National Congress splits due to internal divisions. 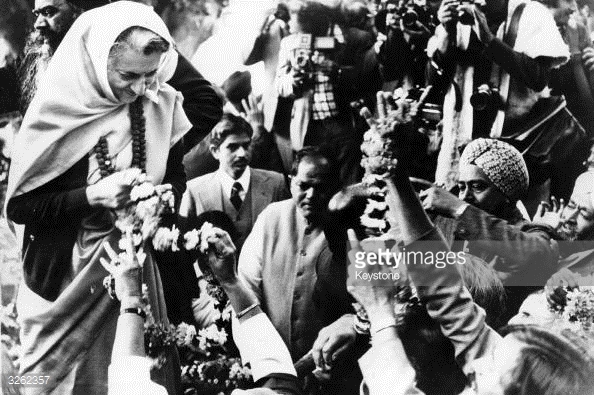 The picture shows Prime Minister Indira Gandhi after her new Congress Party won the 1971 elections. Sixth Lok Sabha Elections (1977): In the general elections held after the end of the state of emergency in 1977 the Janata Party, an alliance of parties with Morarji Desai as their leader, comes to power to form the first non-Congress government in the history of the Republic of India. 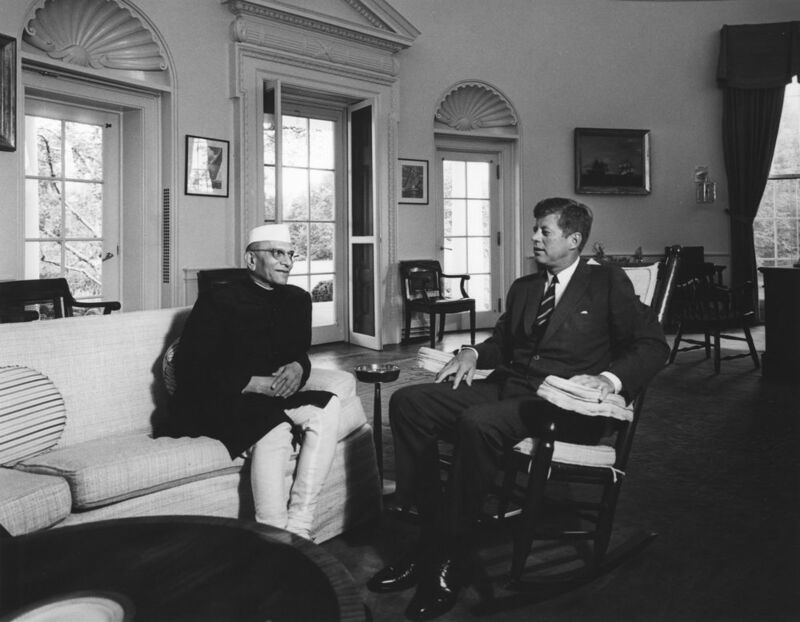 In this 1962 photo, Morarji, then India’s Finance Minister, is seen with John F. Kennedy at the White House. 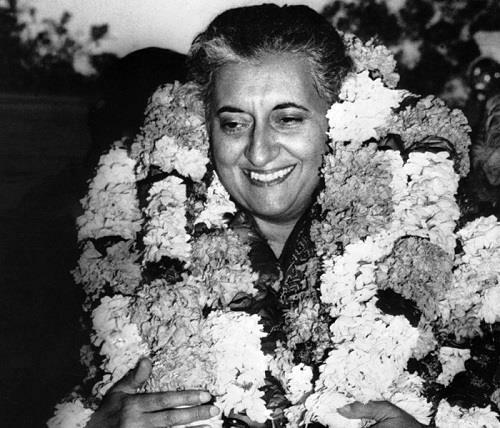 Seventh Lok Sabha Election (1980): In-fighting within the Janata Party works in favor of Congress and the party returns to power under the leadership of Indira Gandhi. Eighth Lok Sabha Election (1984-85): Held immediately after the assassination of Prime Minister Indira Gandhi, Congress wins the 1984 elections and Indira’s son Rajiv Gandhi becomes India’s youngest prime minister. The Telugu Desam Party from Andhra Pradesh led by N.T. 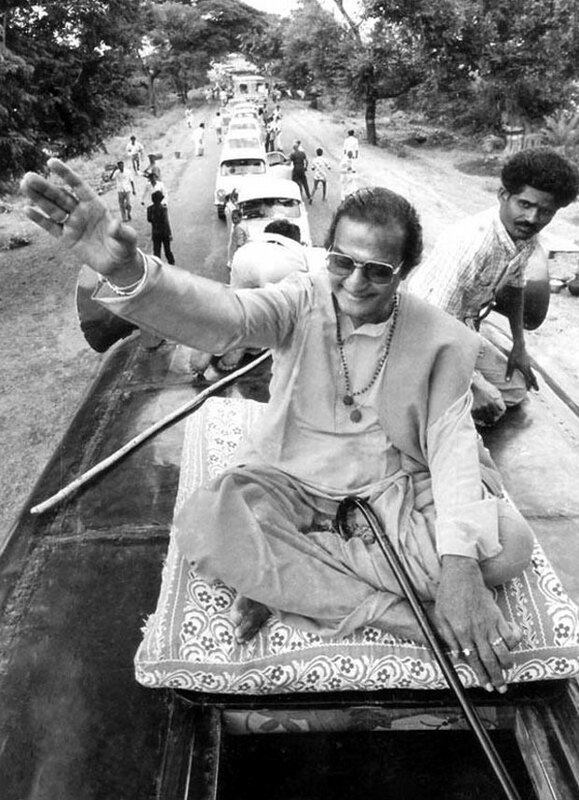 Rama Rao (in picture) emerges as the first regional party to become a national opposition party. 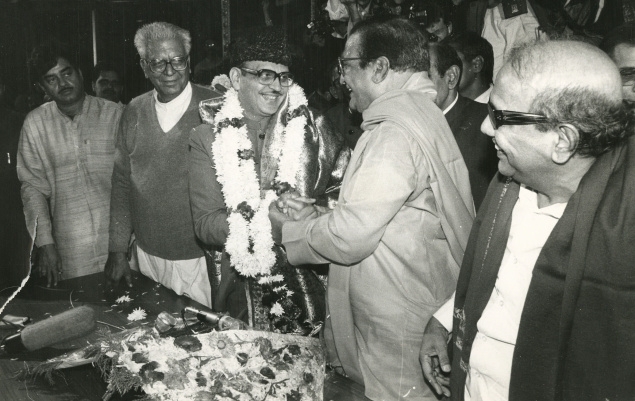 Ninth Lok Sabha Election (1989): The National Front, a coalition of political parties, comes to power. V.P. Singh (in center), who had broken away from the Congress Party, becomes India’s prime minister. 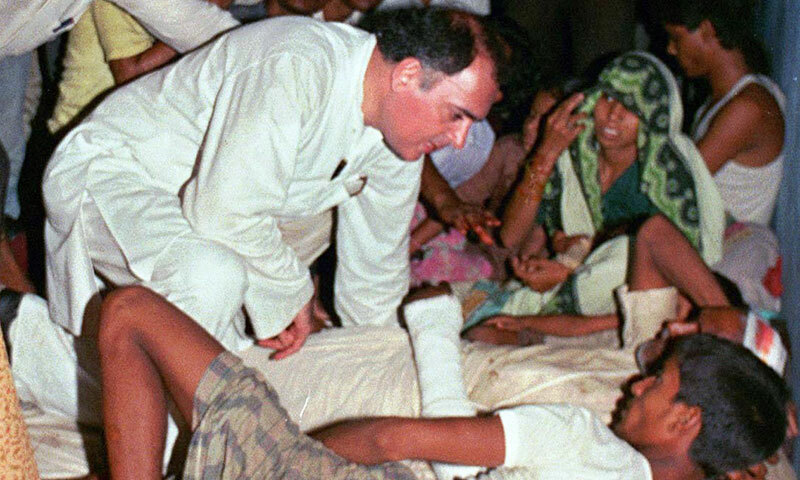 Tenth Lok Sabha Election (1991): Late Indian Prime Minister Rajiv Gandhi listening to the grievances of a man while campaigning for election in central India, a few days before he was assassinated. In the elections no party obtains a majority. The Indian National Congress forms a government with the help of Left parties with P.V. Narasimha Rao as prime minister. Eleventh Lok Sabha Election (1996): The 1996 elections has a fractured outcome and once again India has a coalition government. The country would see three Prime Ministers in two years, forcing it back to the polls in 1998. 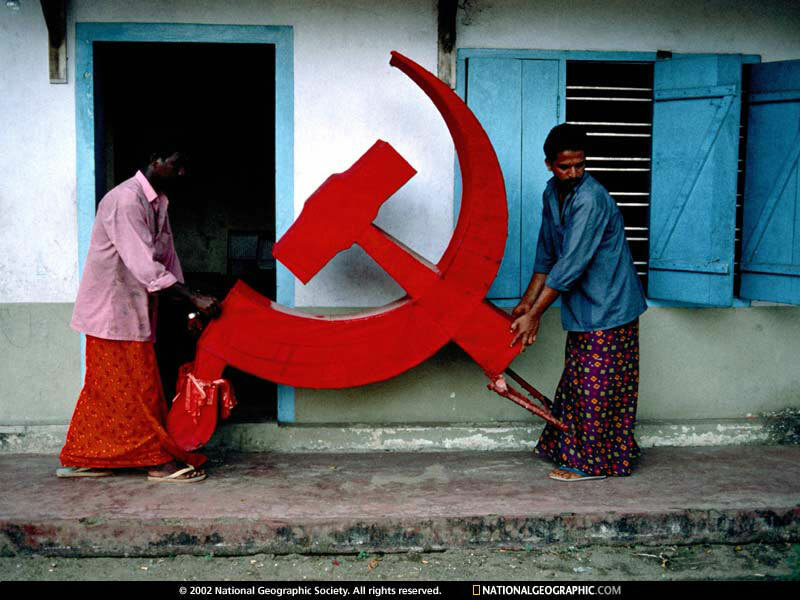 In the photo two men place a hammer and sickle symbol outside the Cochin Communist office during the 1996 election campaign. Twelfth Lok Sabha Election (1998): The collapse of the coalition government elected in 1996 led to the 1998 elections. Once again no single party nor alliance is able to create a strong majority and the government collapses in late 1998. 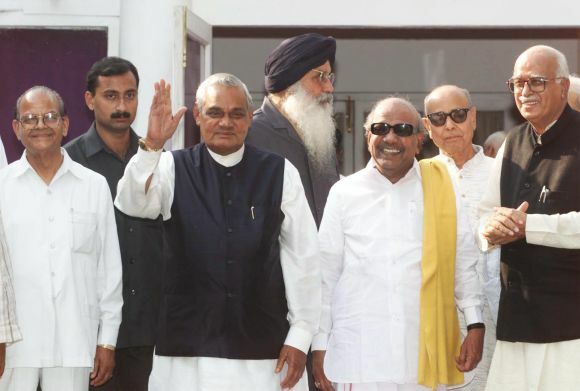 The picture shows members of the National Democratic Alliance (NDA), a coalition led by the Bharatiya Janata Party which formed the government at the center, with Atal Bihari Vajpayee (center) as prime minister. Thirteenth Lok Sabha Election (1999): Held soon after the Kargil War, this was the first election where a coalition of parties, the National Democratic Alliance (NDA) headed by the Bharatiya Janata Party (BJP), manages to attain a majority. 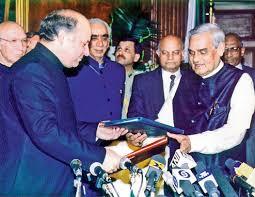 Atal Bihari Vajpaye, seen here with his Pakistani counterpart Nawaz Sharif after they signed the Lahore Declaration (1999), was once again sworn in as prime minister. Fourteenth Lok Sabha Election (2004): The Indian National Congress returns to power after eight years out of office through the Congress-led United Progressive Alliance (UPA). Manmohan Sigh selected to serve as Prime Minister. 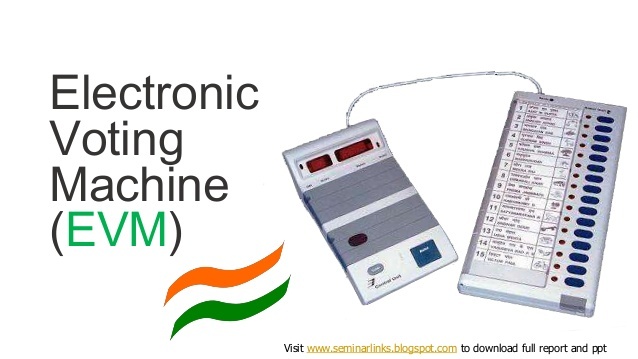 The Elections Commission extended the use of electronic voting machines nation-wide in the 2004 general elections. Fifteenth Lok Sabha Election (2009): The Congress-led United Progressive Alliance retains power and Manmohan Signh continues as prime minister. 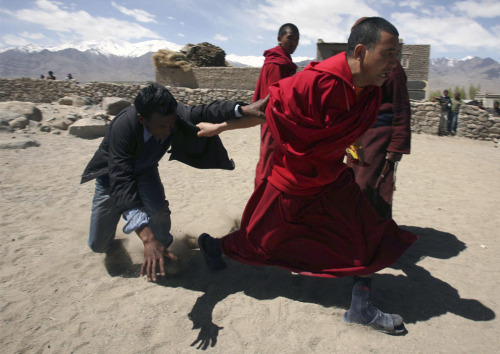 In the picture a monk who is also a voter, drags a polling agent outside a polling station in Thiksey, 20 km east of Leh. The voters claimed that the agent was involved in false voting. Sixteenth Lok Sabha Election (2014): The largest democracy in the world goes to polls in April-May, 2014. Photo-credit: The Old India Photos; Photo Division; Pop Screen; JFK Library & Museum; Anchal Project; LV Prasad Eye Institute; Wikimedia Commons; Dawn; National Geographic; Rediff; Boston.com. Mary Ann Chacko is a doctoral student in the Department of Curriculum and Teaching at Teachers College, Columbia University. Her dissertation examines the Student Police Cadet program implemented in government schools across Kerala, India with a focus on adolescent citizenship and school-community relations. She is an Editor of Cafe Dissensus. Read more of her work on her blog, Chintavishta. Hi, novel idea to represent the history of Indian elections. I liked it. I have a query, you followed linearity in representing the history of Indian elections but why did you put Indira Gandhi’s picture first in the article instead of Nehru’s? Is there any reason behind it? Indira’s picture was put as a caption. The template demands a caption. Indira’s picture is merely a caption. The first pic in the photo-essay is that of the tanga with the Communist political activists.